By now your have probably heard the horror stories of unsuspecting ex-pats forced to pay hefty sums of cash just for a dealer to scrap their cars. Or even worse, those unscrupulous individuals who simply couldn't be bothered to recycle anything and dump their cars in woods. 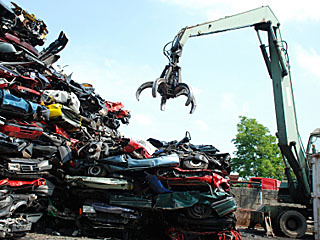 But thanks to the enactment of the Car Recycling Law, disposal is much less of a hassle. Let's take a look. The Law Regarding the Reclamation of Reusable Resources from End of Life Automobiles (shiyo-sumi jidosha no saishigen-ka to ni kan suru horitsu 使用済自動車の再資源化等に関する法律). The Car Recycling Law (jidosha risaikuru-ho 自動車リサイクル法) was put into effect in 2000 and updated as recently as 2008.The goal was to tackle the problem of people abandoning old cars due to the high expense of disposal as well as help localities deal with the mounting fiscal and environmental costs of dealing with derelict cars. The law compels all car owners to essentially prepay for the project cost of recycling and disposing of their vehicles when they reach the end of their usable life. Unlike many European countries, the cost of disposal is born almost solely by the individual rather than the manufacturer. With some exceptions, recycling fees must be paid at the time of purchase for both new and used vehicles. This includes motorbikes and scooters. The program is managed by a government designated non-profit, the Japan Automobile Recycling Promotion Center and a consortium of auto manufacturers and disposal companies. The official proof of payment for auto recycling fees is your recycling voucher (risaikuru-ken リサイクル券). 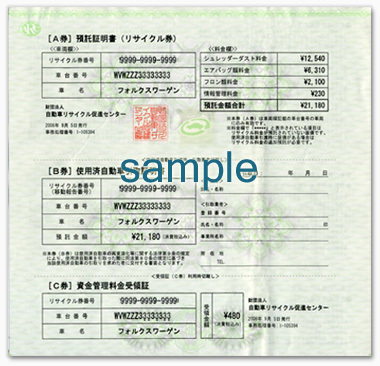 This is a very important piece of paper so you should keep it with you at all times, preferably tucked away along with your inspection certificate (jidoshaken-sho 自動車検査証) and insurance certificates. The recycling voucher is issued by a dealer or passed along as when you sell a car. However, even with used cars, you will still be required to pay an equivalent recycling fee to the Japan Automobile Recycling Center (the site has a handy calculator to see if everything is paid up). This can be a bit of a complex process so you might want to consult a Japanese friend and call the local recycling center branch to make sure everything is in order. The voucher is necessary for your bi-annual car inspection (jidoshakensa 自動車検査 or simply shaken) and when you sell or dispose of your car. On the voucher there is some basic info such as your voucher number, vehicle body number and car manufacturer name. There is also a cost break down of how much each recycling category costs. The slip is divided into 3 sections, A, B, and C. The top most section is your current personal information while the bottom B and C sections are used to transferring ownership of the car or car disposal. There are 3 main recycling categories that factor into the total cost of of the recycling fee. Shredder dust fee (shurreda dasuto ryokin シュレッダーダスト料金), air bag fee (eabaggu-rui ryokin エアバッグ類料金), and fluorocarbon fee (furon-rui ryokin フロン類料金). On top of that, there is the information management fee (joho kanri ryokin 情報管理料金) and capital management fee (shikin kanri ryokin　資金管理料金) included in the price. The later two fees are only 130 yen and 480 yen respectively. The recycling costs of the former 3 categories changes based on the total mass of the car, the number of air bags, the size of the radiator and the manufacturer. Generally it is between 10,000-20,000 yen but if you are buying from a dealer or individual then it is a good idea to inquire about the total price. When the time comes to get rid of your car, you need to either take it to a dealer or a shop that is licensed to dispose of cars (known as haisha 廃車). Most dealers don't dispose onsite so they will likely ship your car to a specialist that does. This is where your recycling money comes into play. Instead of paying for someone to break apart your car, dispose of hazardous substances and recycling the renewable materials, the specialist shop will bill the Japan Automobile Recycling Promotion Center. If they can do it all under cost then they can make a profit to boot. In the event that your car is deemed to be in sufficiently good condition to sell overseas, your money will usually be used to help local governments fund environmental protection and waste disoposal efforts. In addition, since the JARPC acts as essentially a bit monetary trust, any interest earned on your recycling fee via investments and bonds will go to helping out municipalities (at least that is what they say). That's insane, considering that recycling a car is actually profitable. Unfortunately the whole car buying and ownership system here is kind of a big racket for dealers, garages, and semi-official bureaucratic organizations. Where can I buy the cheapest recycling heavy truck engine?